Ideas for Sweet Shop Candy Boxes - Parisian Party (set of 12) . Package that Paris party with style! Whether it is a Paris themed wedding reception or bridal shower these shimmery boxes, adorned with a modern Eiffel tower, make it easier than ever to prettily package take-away treats as sweet as the event. Fill them with cookies, candies, chocolates and more; these sturdy paper boxes can take it! Guests at your fancy French soiree will be delighted at what they find inside and happy to share its contents with others, spreading the joyous feelings from the event. Whether it's a wedding shower, baby shower or the big wedding day, this box offers a customizable label with just the right image to match your Paris theme, along with nine fashionable colors to choose from for the box itself. 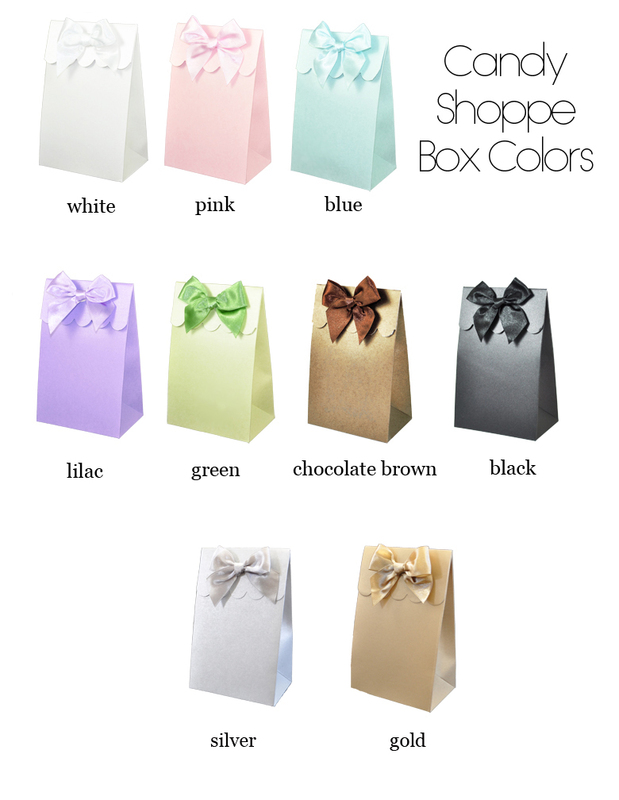 Each box also comes with a matching colored satin bow. Stickers on the box flaps hold them closed once they're filled. Get a few different colors to mix and match bow and box colors for a unique contrasting look.